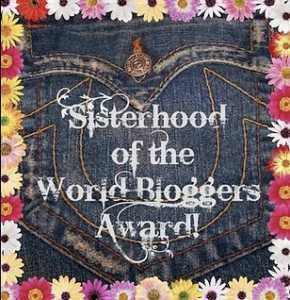 I am delighted that Shelley at http://livingwithshadows.wordpress.com has nominated me for the Sisterhood of the World Bloggers Award. thank you, Shelley, I really appreciate you thinking of me. It’s always an honour when fellow bloggers nominate you and, for me, it serves to underline the friendliness, kindness and mutual support that exists in the blogging world. I am also delighted to say that I have finally worked out how to get images into the widget boxes and managed it first time today, a miracle indeed! Chrissy writes delightful posts which really lift my spirits when I open them up. She’s also into crystals, like me, so is obviously a great gal! Amy posts wonderful photographic images which always amaze me with their brightness and creativity. Plus she loves dogs! Brigid writes about organic gardening and is a fount of wisdom on plants, growing plants, organic gardening, facts about plants, and so on. Fascinating stuff which I pass on to my husband as he has green fingers. Plants look at me, then wilt and die! Rita writes beautiful poetry and offers lovely wisdom which I so much appreciate when I read her posts. Ayse posts lovely poetry and quite stunning watercolour images, mainly of herself and occasionally of places and people. I drool with envy when I view her images. Mary writes about the world of art – sometimes about the paints themselves, sometimes about activities in the world of art, sometimes philosophical posts about artists and the creative beings within us. Good stuff. Your favourite colour …. Purple – what else? Your favourite animal … I don’t have a favourite animal, Iove my cats and dogs, just love animals and have done since I was a kid. My mum said she used to dread movies where an animal died because there’d be a great wail from me, plus floods of tears, and she’d have to take me out to calm me down! Facebook or Twitter …. Facebook. I’m on Twitter but by sheer serendipity, have no idea really how it works. Your favourite pattern …..Dip out on this, I hate patterns, much prefer plain colours. Do you prefer getting or giving presents?….I love getting presents and I love giving presents equally. Your favourite day of the week …I love every day of the week. Your favourite flower …. Gazanias. They are so bright and cheerful, very sturdy and even I can’t kill ’em off! What is your passion? ….. My art and photography. Kindness. Tolerance. Love. You know how ı like you and ı am so glad you like my works 🙂 I’m honored that your nomination me for The Sisterhood of the World Bloggers award…You are so kind as usual…sure ı would like to accept with a great pleasure!!! So what should ı do? answer the questions? What is your passion? : Art for nothing love for everthing! Thank you for being part of the sisterhood too, Ayse, your posts always brighten my day. An award you greatly deserve!! Thank you very much, Mary, I really appreciate your comment! Thank you, Violet, just looked at your blog – a fellow traveller, nice to meet you. Oh, don’t worry about privatising you blog, be honest, be open, be yourself and people will give you a helping hand. It’s amazing how open people are about their challenges and how supportive they are to other bloggers, whether long-standing or just starting out. And if people aren’t kind, you have the ability not only to block their comments but also to understand that they’re jealous of who you are! ….your knack for Naming Things, as they Are…. Your ‘Arty-Fartiness’…. and the Smile You wear that makes me Giggle, to name just a few…. Thank you, I find it interesting naming my art pieces because I look at them and then the name pops into my mind. As for arty-farty – life’s too short to be po-faced! ~ my favorite Animal is my Friends & Companions of the ‘Qwak-a-Doodle Meow Klan’ as they make the Best Family members! * I’d like to ‘Trade’ if I may, the Question of ‘Beverage’ for the Answer of ‘Patchouli’… because I Would if I Could! ~ the Once-in-a-Lifetime Arrangement of feathers on one of my newest Companions, Audrey DukkBurn’s back, as the Pattern there seems to ‘move’ as You Look long enough to Watch It…. ~ and, if You ever Choose to Know me, you’ll see I’ve gone Beyond Passion, into Obsession over My Companions, that some folk insist on calling ‘Animals’…..
Good one, now you can rest easy with a clear conscience! Congratulations with award, it’s very deserved! Thanks very much, Otto, much appreciated. thank you for taking part. keeping it to six is a very good idea. i find the ones that are 10 or more very draining to find, especially when there are so many no award blogs and a criteria to stick to! still wonderful to be nominated but sometimes they can be a… hmm i’m saying challenge but it’s not the right word! slow brain at the moment! i also meant to say got to love the purple! my new purple hair dye just arrived today! getting a new hairdo on tuesday! a change from pink! and also Gazanias.. wow!!!! what striking colours! got to get me some of those one day! I use Fudge’s Blueberry Hill to dye my hair purple, but I only put it on the front with a toothbrush, easy to apply that way and it fades nicely without any roots showing through. Ideal for my grey hair and it’s amazing how many people say they love the purple colour of my hair. It’s lovely here in North Cyprus, people are very open so in supermarkets very often check-out assistants will tell you how much they like your hair or a few of them will congregate and gasbag with you, with one translating all the comments. We have great fun! Purple what else? That really made me smile. I think that women who have that attitude to purple are very special. Why other people don’t have strong colour attachments I have no idea! I have a fantastic DVD called “Fabulous Fashionistas” about 6 women over 70. One of them, who is surrounded by screamingly bright colours says of beige: “Don’t wear beige. It’s the colour of death”. Which I love. If you can get hold of this – it’s about 45 mins long – it’s inspirational. That’s true! I’ve never understood dull colour wearing. It changes my mood completely when I wear the right colour!